Many are interested in it and would love to know more. A majority of workers have transitioned from the fear of artificial intelligence taking jobs to that of AI actually helping us do our jobs better quite fast. That's according to the latest Automation Anywhere report based on a poll of 4,000 employees, which says workers don’t fear AI will take their jobs, but see increased value in the tech and are eager to learn more about it. The report is called Making Work Human: 5 Challenges, and claims that 72 per cent of employees at large enterprises see AI as something they work with, not something that will work instead of them, with only eight per cent feeling the opposite. More than half think AI will boost their productivity in the long run, but feel their company needs to give them more opportunities to test the tech out. Again, a smaller number (16 per cent) feels the opposite way. In the UK, this number jumps to 25 per cent. Two thirds would love to know more about AI and how it can help them do their jobs better, but the problem is – less than four in ten are using it at the moment. In the UK, it’s one in four. 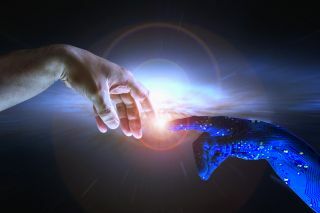 The report says there are multiple challenges organisations face as they try to scale the use of automation, including having a skilled workforce, the need to avoid ‘AI washing’ (overstating the capabilities of the tech), or resilience. “Last year, we conducted research to explore whether automation could make work more ‘human’. We found that augmented companies not only enjoyed 28 percent greater performance levels, but also scored 33 percent higher on factors deemed to make a workplace more ‘human’”, said Dr. Chris Brauer, Director of Innovation in the Institute of Management Studies (IMS) at Goldsmiths, University of London, and leader of the research.